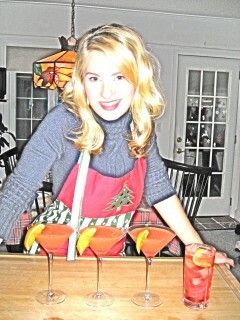 The Santa Fe Reporter just published my recipe for Blood Orange Margaritas in their holiday drinking guide! But I go home to Buffalo every Christmas, a spot known not for its warm winds and cool drinks, but rather, its cold weather and hot wings. Geography aside, every Christmas I am charged with concocting a holiday cocktail for the family. Last year, I paired Maple Manhattans with hors d’ oeuvre sized Potato Latkes. 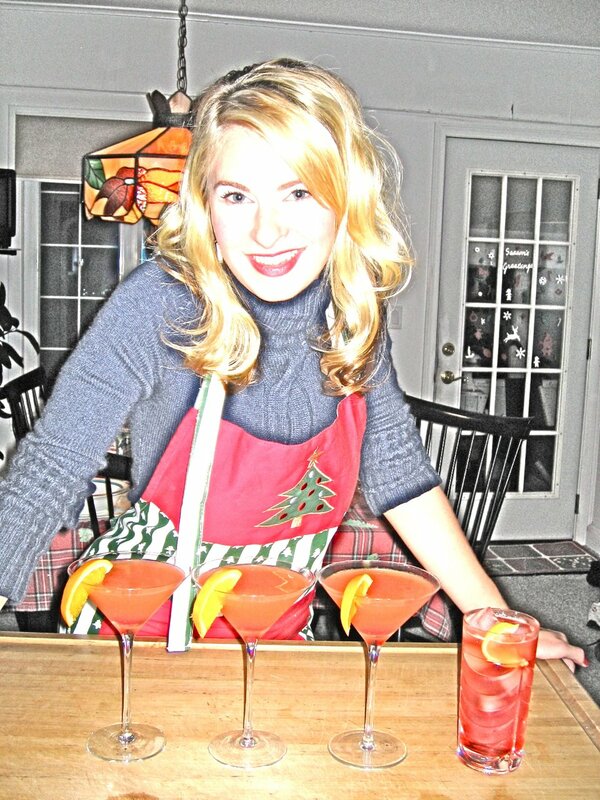 The year before, I donned my mamma’s Christmas Tree apron and served negronis up, with a special double order, on ice, for Aunt Susie. The youngest of her three kiddies had just announced he no longer believed in Santa…cut her some slack. This year, I’m chomping at the bit to wow the fam with my cucumber margaritas. Maybe it’s because I’m headed to Mexico for New Year’s (with a man whose “over the top” mantra perfectly suits my own penchant for all things “top notch!”), or maybe it’s because these chili-rimmed cocktails take on the traditional red & green holiday hues, but whatever the reason, margaritas always make sense to me. Happily, cucumbers never go out of season and neither does tequila. Erin and I have been known to pour margaritas from the lazy days of summer to first snow, right through onto spring. We quelled her gambling habit with a poker game and mango margaritas last June. On Thanksgiving, her conservative Connecticut brood surprised me by serving pint sized frozen margaritas to pair with turkey. We even have a herradura spiked shrimp canapé on our Dinner Belle menu! Whatever the reason, I believe it can always be tequila season. To prepare simple syrup, mix one part water with two parts sugar and bring to a boil in a saucepan, stirring to dissolve sugar; remove from heat and allow to cool. 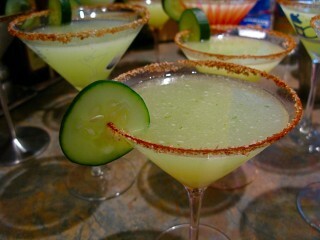 Place the cucumber, jalapeño, tequila, Cointreau, simple syrup, and lime juice in a blender and process until smooth. Then, on a small plate, mix a few pinches of ground cayenne pepper with salt; run a lime wedge around the rim of a martini glass, and holding the glass inverted, dust the wet glass on the outside rim with the cayenne/salt mixture until evenly coated. If you keep the salt on the outside rim it won’t fall into your drink. Pour the margarita mix from the blender into the glass and garnish with a cucumber wedge. If you like heat, add a few of the jalapeño seeds to the blended mix. If not, be sure to remove them. Cayenne pepper is also quite hot so be sure to use it sparingly, according to taste. i still would like to get some of those naked bars you have. i have wanted some for over a year now. Great drink i presume, thanks for the preparation tip. You can also check out tomato juice as the alternative for it.